Finally, I found a Dario Argento film I'm not virtually tripping over myself trying to watch again. Inferno is the spiritual successor to Suspiria, but while they share a similar lineage this feels more like the unloved second child whose parents just weren't trying as hard. It's still an enjoyable watch—it still had good parents even if they seem less inspired—but some of the magic is missing. It wouldn't be an Argento film if it weren't overflowing with style, and here the film definitely delivers. There's an absolutely wonderful blue and purple color palette which elevates the hallmark almost-surrealism of all Argento's giallos. And there's another thing it's overflowing with: the bright red blood which is also characteristic of the director's body of work. The unflinching camera is drawn magnetically to the stuff, and while the murders rarely have an effective sense of dramatic impact, they are certainly always pretty. The problem with Inferno—the reason these death scenes don't have much impact—is that the film doesn't have enough character development. There's no protagonist in the traditional sense of the term, and instead the film jumps around between the perspectives of a hodgepodge of various people, most of whom are killed off before we can really get attached to them. This works as a way of keeping the audience on their toes in contrast to the traditional Invincible Main Character approach (you never know who might die once it's made clear that everyone is expendable), but the unpredictability is less valuable when emotional connection to the characters is missing. Instead of spending time with its characters, most of the film is concerned with the mythology surrounding a trio of mothers: mater suspiriorum, mater lacrimarum, and mater tenebrarum. Together, the three form a thematic triumvirate reflected in Argento's previous and subsequent films Suspiria and Tenebre. Here, the director continues to explore his unique sexual politics and the relationship between femininity and death, and this is by far the most interesting aspect of the film. Unfortunately it doesn't really go anywhere until the finale, at which point we just get more of what we already have in the other two films of the trilogy. Oh, and the Goblin soundtrack is missing. I know that's not really a fair critique of the film, but next to the iconic scores in Argento's other films, this one is just disappointing. 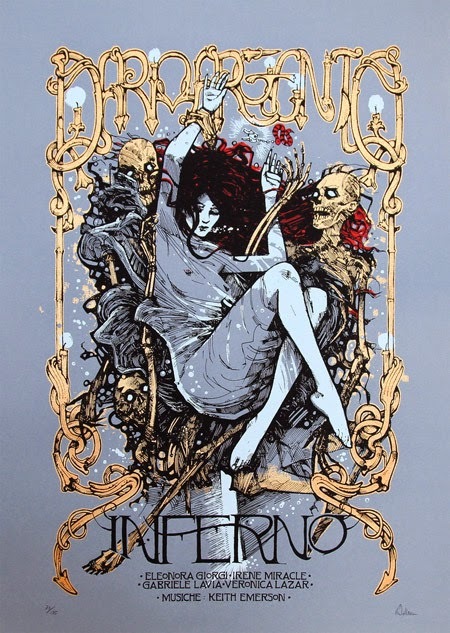 Overall, Inferno is a generally entertaining experience, and I would still recommend it to fans of Argento. If you haven't seen any of his other movies, however, I would recommend starting elsewhere.